Ted Su Hybrid Strap. Made using alligator, alcantara and nubuck. Original Ted Su design. The Hybrid strap is made by carefully hand stitching different exotic materials together. Exotic (alligator), high tech (alcantara), traditional and durability (calf and nubuck). 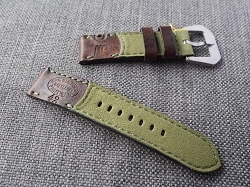 The Hybrid strap requires more than double the time and effort to hand made than regular straps. piece of leather, then cut and stitched into a strap. 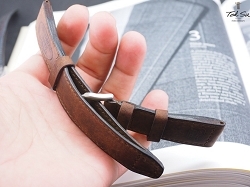 The result is an uniquely beautiful strap that displays both original design and high level of craftsmanship. Strap is made to order. Please allow about 10 days for completion.